Pella French doors are frequently utilized for both replacements and new construction. One of the things that makes their doors so incredibly popular is the options for their door lock systems, which includes their standard multi-point door lock system that ensures your hinged patio doors are secure. Pella makes three different lines of hinged patio doors. If you are having difficulty deciding which door to choose, the available locking mechanisms may help you make up your mind. Can I Paint the Exterior of Pella Windows? Pella's unique multi-point door lock comes standard on all of their hinged patio doors. This lock engages in two to three different spots on the doors, rather than just in the center. This makes your door more secure and more difficult to get open in the event of an attempted break-in. On the Designer and Pro-line patio doors, you must engage each of the locks separately on the multi-point door lock system. If you opt for the Architect series of doors, however, you have the option of getting the Easy Locking Handle. The Easy Locking Handle engages all three of the locks on the door automatically when you pull up on the handle. If you opt for the Designer series patio doors, you have the option of getting the Flushbolt System installed on your doors as well. The Flushbolt System allows you to lock one of the two doors into place without needing to bend over or reach up to do so. The lock is found on the interior of the door right next to the handle. Flipping it on or off can be done with a thumb. Pella's French door locks work only on Pella French doors; they cannot be retrofit to other hinged patio doors due to the way that the doors are constructed around the lock. Not all locks and parts are sold separately, but replacement parts are available in the event that a lock needs repair. In the event that a door or lock malfunctions or needs repair, contact Pella's customer service at 1-877-473-5527. Have your receipt or the Pella ID number located on the door or lock available when you call to get the part you need. You can get instructions for replacing the multi-point locks from Ripley Built. If you wish to purchase a lock or handle in a different finish to retro fit an existing Pella door, you can purchase them from Swisco which carries replacement parts for Pella's internal locking mechanisms. 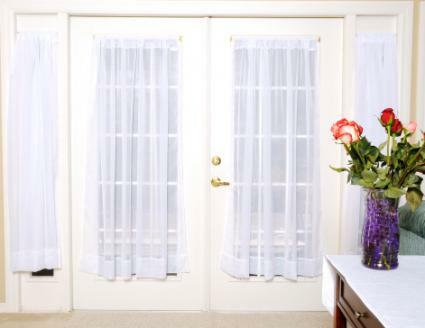 Pella hinged patio doors and their locks are available at numerous locations around the country. You can schedule an in-home consultation directly with Pella, or find the nearest distributor if you plan to install the doors yourself on their distributor page. All Pella doors and locks can be installed either by a recommended contractor, or by a DIY homeowner who has some experience with installing and leveling doors. If you are considering Pella hinged patio doors, take the available locking mechanisms into consideration as you make your decision. With the different locking systems available, your needs could influence your eventual choice.